A good CRM (client relationship management) system is a game-changer. I think I can safely say that I wouldn’t have made it through 2017 without my CRM. 2017 was a big year of firsts. First season offering stationery design. First time doing workshops. First full season doing wedding day-of calligraphy. First time doing a wedding show. First year selling at markets. It was a lot, and I’m pretty sure I would have dropped some clients along the way without this system working for me. 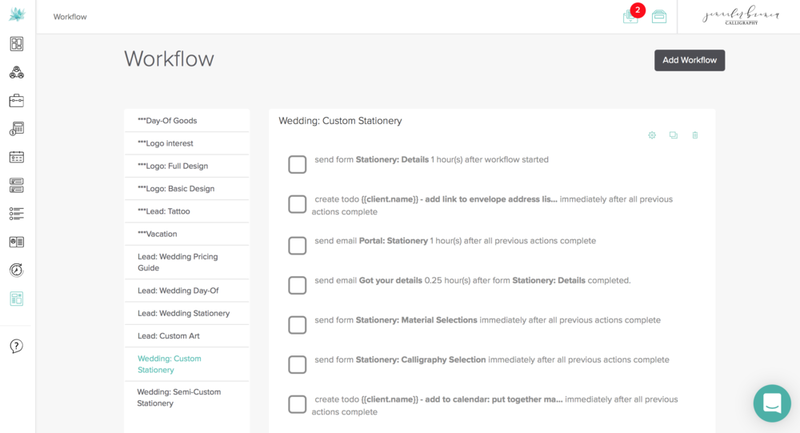 I signed up for Dubsado in February of 2017, after looking for a CRM made for wedding professionals and creatives. I’d been looking into Honeybook, but discovered that it wasn’t available for Canadians and was thrilled to find that Dubsado was Canada-friendly. There are a lot of reasons I love it, and here are a few. 1. Invoices, contracts, emails, and proofs - all in one place. One program houses all my invoicing, contracts, emailing, and design proofs. It all makes me seem like a way more put-together professional than I am. Seriously. Contracts can be signed online, and by having contract templates, you might never have to edit your contracts. Dubsado uses smart fields (like “client name” or “job date” or “invoice total”) in your contract (and form) templates, so when you add that template to a job, all those details are automatically filled in for you. As a designer, many of my projects - from wedding stationery and day-of goods to logos and tattoos - need to go through a proofing process. Rather than creating new documents for each new client, I’ve been able to create “templates” for different kinds of projects that I can carry over from client to client. These proofs get sent out as forms which include questions for my clients to fill out and respond to so I can get every detail I need. Now, I have beautiful forms that I don’t have to re-create every time, and I can just go in and adjust the details for my client. 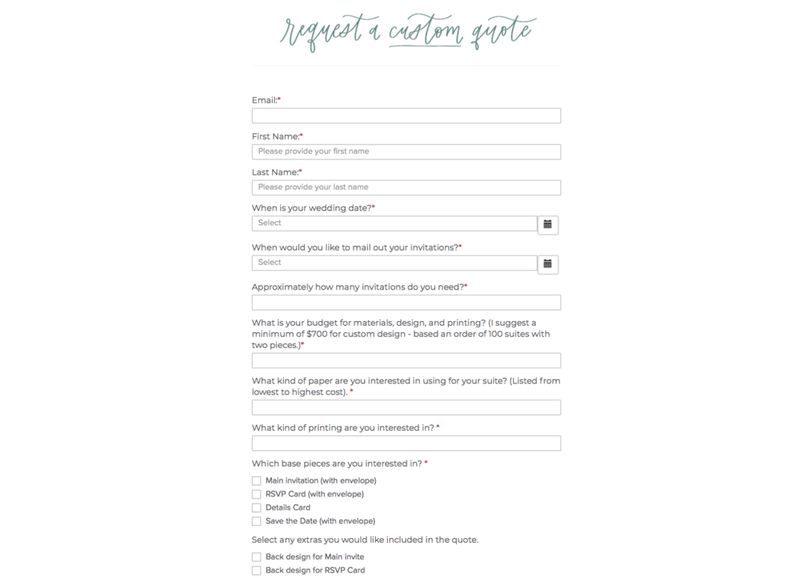 I also love form templates because I can have a standard questionnaire that I send out to each stationery or logo client so that I can easily get all the details I need to get started on their job, without having to hunt through emails for the information. Forms can also be used as “lead captures,” which are short forms you can put throughout your website for people to inquire through. For example, I have a lead capture form on my website specifically for stationery where my leads tell me all the pieces and quantities they need, and it gets added to Dubsado as a form. I can then quickly and easily create a proposal for them in Dubsado. These are the real game changer that I’ve only been utilizing to their full potential recently. You can make Dubsado WORK FOR YOU. Workflows are a magical thing. With workflows, I’m able to create a template job process and have my workflow do my emailing and invoicing for me. It’s easier to explain this with an example. Let’s say someone fills out a form on my website inquiring for a stationery quote. With a workflow, I have it triggered so that as soon as that form is filled out, an email is sent (with a smart field that adds their name in automatically) telling them that it’ll take up to 5 business days to prepare their quote. As soon as that email is sent, Dubsado makes a task (and email reminder) telling me to create their quote. Once the quote is created, I check off that to do, and it automatically sends the quote with my canned email explaining general details. And that’s not even the good stuff yet. I’ve mapped out my entire process for each different service I offer, so that it’s as automated as possible. This saves so much time because from project to project or lead to lead, we tend to send nearly identical emails - and when you take the time to map out all those emails beforehand it saves you the energy in the long run and ensures that you're clients are always being taken care of. Proposals are beautiful. Dubsado has created the ability for you to quote a client and send them an invoice and contract at the same time, all in one form. How it works: create your quote as an invoice, then in a Proposal form, all those invoice items and prices are auto-populated. You can attach a contract as well, and if your client accepts the proposal, they are automatically directed to the contract to be signed, and the invoice to be paid. You can book clients without lifting another finger. Pro Tip: You can also add “packages” to your proposal templates, that are additional items your clients can add to their project (if they aren’t already on the invoice). It’s a great way to promote additional services you offer. For example, with stationery proposals, I include a bunch of different envelope addressing services that I offer and clients can choose if they want to add any or not. If they choose to add them they are automatically added to the invoice for you. So, let’s say you’re a photographer and you want to give wedding clients the option to add additional hours to the package you’ve quoted, or tack on a “morning after” session, or even add a photo album. You just add it as a package and your clients can add it to their invoice without you having to do anything more! Beautiful. Every time I’ve talked about another feature, I’ve wanted to say “okay, this is my favourite.” And this is a big one. But so are the others, and I just can't decide which I love the most! Since my process with design is very heavily reliant on proofing and receiving feedback from clients, I need a space to house everything for easy access to my clients, and this is were the Client Portal comes in. The client portal is essentially your client’s website, where they are able to access their invoice, contract, and all forms or proofs you have already sent their way. They don’t have to go back and hunt through their inbox to find what you’ve discuss because it is all in one place for them. Making everything super convenient, and making sure that nothing is ever missed. Bonus: you can see when your client has viewed or completed your forms! I use this mostly for my proofing process, so that clients can very easily go back to past proofs and forms. 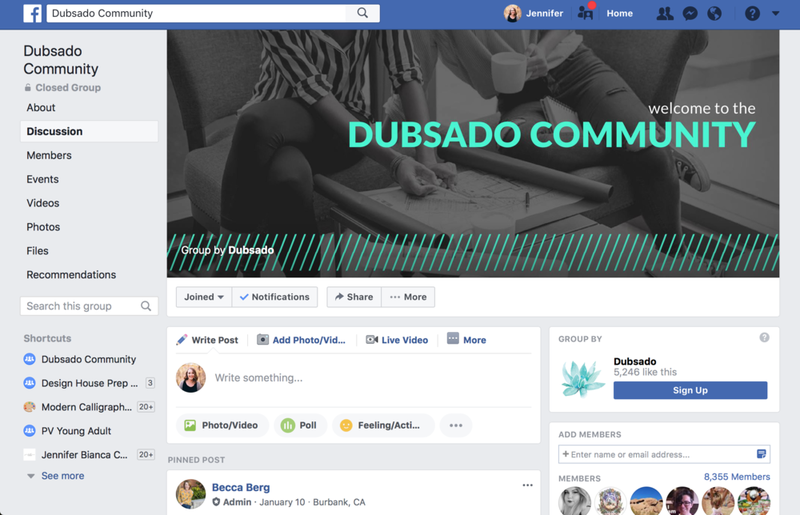 The Dubsado team and the Facebook Community are incredible. It is true that Dubsado isn’t perfect yet. BUT Dubsado is super open about the changes coming up, and are constantly working on new features and improving current features. They listen to what their customers want and work on adding new things regularly. A sweet husband and wife duo, Jacob and Becca, started the company and it has grown beyond the two of them, but they just seem like a fun family that enjoys working together. They are seriously on top of support, regularly responding to questions and inquiries beyond their normal working hours, and they have a bunch of services that help you set up Dubsado with their help for free (like helping you set up your workflows!). If you use Dubsado, I also highly recommend the Facebook community. A bunch of creative professional helping each other out with the organization of their businesses. We’re the Dubsado family. They have a free trial, so check it out! Dubsado offers a free trial up to 3 clients (no time limit!) so you can go in and start to see the features that could be useful to you. If you sign up with my affiliate link (or use code "jenniferbianca"), you get 20% off your first month (or full year if you pay for the whole year at once!). So, that’s $5 (USD) off your first month OR $50 off your first year (plus the $50 you'll already be saving with the annual plan!). It’s is WORTH it, friends.